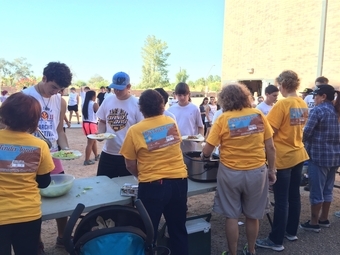 The Gilbert Band Booster organization is made up of parents just like you. It is a non-profit, incorporated organization that works with the Gilbert High School band director to assist in providing financial and volunteer support for the Gilbert High School Band Program. The Executive Board oversees finances, while the Advisory Board oversees the day-to-day support. Parent volunteers are critical to the success of our programs. We host a marching band invitational in the fall, and a winter program invitational in March, both of which raise a great deal of money for our programs, and both of which require an army of volunteers. Our amazing parent boosters make it all possible. If your student is enrolled in any of the GHS band programs, you are already a band booster, and we encourage you to get involved! If your student is new to the band program, don't be afraid to reach out, ask questions, and volunteer. Whether you're in the stands at a football game or running a bake sale at the band concert, any current booster active with the program will tell you - not only is it a great way to bond with your musician, it's also a fantastic way to meet other band parents and make great new friends. Boosters getting some business done - and cooling off a little - at band camp in Prescott, Arizona. Feeding the band before the state competition, a critical part of preparation on a show day. Our Band Dads and Moms unloading the trailer and assembling props at a competition. Between show shirts and Tiger Tails shirts - boosters have an entire "gold" section in the closet!